Nieliniowa analiza dynamiczna konstrukcji narażonych na działanie nagłych obciążeń (wybuchy, uderzenia). Metoda Elementów Skończonych (MES). Cichocki K., Ruchwa M. (2016) Distribution of damage in unconventionally reinforced concrete slabs subjected to impact loads. In: M. Kleiber et al. (eds.) ADVANCES IN MECHANICS: Theoretical, Computational and Interdisciplinary Issues. London: CRC Press Taylor & Francis Group, pp. 129-132. Cichocki K., Domski J., Katzer J., Ruchwa M. (2015) Static and Dynamic Characteristics of Waste Ceramic Aggregate Fibre Reinforced Concrete. Transactions of the VB  Technical University of Ostrava Civil Engineering Series, De Gruyter Open 10.1515/tvsb-2015-0005, No. 2, Vol. 15, pp. 1-14. Cichocki K., Ruchwa M. (2015) Distribution of damage in unconventionally reinforced concrete slabs subjected to impact loads. In: 3rd Polish Congress of Mechanics and 21st International Conference on Computer Methods in Mechanics, PCM-CMM-2015. Short Papers. Gdańsk, Poland, 8-11 September 2015. Gdańsk: Polish Society of Theoretical and Applied Mechanics Gdańsk Branch, pp. 73-74. Cichocki K., Domski J., Katzer J., Ruchwa M. (2015) Static and Dynamic Characteristics of Waste Ceramic Aggregate Fibre Reinforced Concrete. In M. Krejsa (ed.) 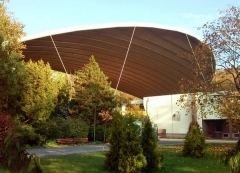 13th International Conference Modelling in Mechanics 2015, Ostrava, Czech Republic, 28-29 May 2015, VSB - Technical University of Ostrava, Faculty of Civil Engineering, pp. 78. Cichocki K., Domski J., Katzer J., Ruchwa M. (2014) Impact resistant concrete elements with nonconventional reinforcement. Rocznik Ochrona Srodowiska - Annual Set The Environment Protection, Monograph No. 1, Vol. 16, Part 2, pp. 1-99 (Publisher: Middle Pomeranian Scientific Society of The Environment Protection, Koszalin). Cichocki, K. & Ruchwa, M. (2012) Przestrzenne konstrukcje żelbetowe obciążone wybuchem. In: Kiczkowiak, T. & Tarnowski, W. (eds.) Polioptymalizacja i komputerowe wspomaganie projektowania. X. Koszalin: Wydawnictwo Politechniki Koszalińskiej, pp. 7-19. Cichocki, K. (2008) Robustness Oriented Analysis of Concrete Structures Subjected to Blast Exposure. In: Proc. of the 1st Workshop. Action COST-TU0601. Zurich, Switzerland, pp. 123-132. Cichocki, K. (2008) Material Modelling for Concrete Plate Subjected to Blast Load. In: Proc. of 8th. World Congress on Computational Mechanics (WCCM8), 5th. European Congress on Computational Methods in Applied Sciences and Engineering (ECCOMAS 2008). Venice, Italy. Cichocki, K. (2008) Robustness of concrete plates with protective coating exposed to a blast load. In: 2nd Working Group and 4th Management Committee Meetings COST Action TU0601 Robustness of Structures. Timisoara, Romania, September 2008. Cichocki, K. (2008) Numerical Analysis of Concrete Structures under Blast Load. Koszalin: Wydawnictwo Uczelniane Politechniki Koszalińskiej. Cichocki, K. (2008) Rozwój zniszczenia w żelbetowych płytach obciążonych wybuchem. Inżynieria i Budownictwo, 6, pp. 320-323. Cichocki, K. & Wekezer, J.W. (2007) Structural response of paratransit buses in rollover accidents. International Journal of Crashworthiness, Vol. 12, Issue 3, pp. 217-225. Cichocki, K. (2007) Wpływ prędkości odkształcenia na odpowiedź dynamiczną konstrukcji betonowych obciążonych w sposób nagły. In: I Kongres Mechaniki Polskiej. Warszawa, Poland, 28-31 August 2007. Cichocki, K., Garbowski, T. & Adamczyk, R. (2006) Crashworthiness of prestressed concrete poles impacted by a vehicle. In: XIX Ogólnopolska Konferencja Polioptymalizacja i Komputerowe Wspomaganie Projektowania. Mielno, Poland. Cichocki, K., Kwaśniewski, L. & Wekezer, J.W. (2005) Improvements of highway safety through computational mechanics. Advances in Transportations Studies An International Journal Section A, Vol. V, pp. 21-35. Cichocki, K. & Ruchwa, M. (2001) Dynamic response of concrete slab to blast load. In: XIX Ogólnopolska Konferencja Polioptymalizacja i Komputerowe Wspomaganie Projektowania. Mielno, Poland, 5-8 June, 2001. Cichocki, K. & Ruchwa, M. (2000) Steel stiffened plates subjected to a blast load. In: The 6th International Conference on Mechanical and Physical Behaviour of Materials under Dynamic Loading "DYMAT 2000". Cracow, Poland, 25-29 September 2000. Cichocki, K., Ruchwa, M. & Biega, W. (2000) Analiza numeryczna konstrukcji w zagadnieniach związanych z motoryzacją. III Słupskie Forum Motoryzacji - Techniczne i ekologiczne aspekty rozwoju motoryzacji. Słupsk, Poland, 13-14 May 2000.